Living in Minnesota, I am in one of the epicenters of the nation-wide epidemic of obesity, diabetes and related degenerative and endocrine diseases afflicting the human population, many of which I witness every day when out in public. I find it particularly disturbing when health experts, including those in universities and the federal government, simply call for more public education with regard to eating habits and life style, telling people to eat more fruits and vegetables and get more exercise, because other factors are involved in this epidemic. This health crisis is mirrored in many of the letters that I receive from readers of my nation-wide syndicated newspaper column Animal Doctor who have cats and dogs suffering from similar health problems. The underlying factors responsible for turning companion animals into environmental sentinels--- or latter day canaries down the proverbial mine shaft, ---alerting us to harmful chemicals in the environment we share, are beginning to be identified. Indiana University scientists Drs. M. Venier and R.A.Hites have reported that they have found toxic flame retardant chemicals in the blood of pet dogs at concentrations five to 10 times higher than in humans. The study focused on the presence of polybrominated diphenyl ethers, (PBDEs), compounds widely used as flame retardants in carpets, household furniture foam, plastics and electronics equipment that can migrate out of the products and enter the home environment. These chemicals are also found in pork, chicken, butter and seafoods. In their summary of this important study these scientists state:“A previous study from our laboratory showed that pet cats had much higher serum levels of flame retardants compared to humans, despite sharing the same household environment. Dogs, on the other hand, are expected to have lower serum levels of flame retardants because they are metabolically better equipped to degrade these compounds. Thus, we hypothesized that dogs might be more similar to humans in their response to these environmental stressors and be better indicators of human exposures to these contaminants. Serum samples and their food were collected from 18 dogs and analyzed for PBDEs and other emerging flame retardants. The concentrations of PBDEs in dog serum and dog food averaged 1.8 ± 0.4 ng/g wet weight (ww) and 1.1 ± 0.2 ng/g ww, respectively. While the dog serum samples were dominated by the tetra to hepta BDE congeners, BDE-209 was the most abundant congener in the dog food. This difference in congener pattern was analyzed in terms of half-lives. Assuming food as the main exposure source, the average half-life in dog serum was 450 ± 170 days for the less brominated congeners and 2.3 ± 0.5 days for BDE-209. Dust was also considered as an additional exposure source, giving unreasonable residence times. In addition to PBDEs, other flame retardants, including Dechlorane Plus, decabromodiphenylethane, and hexabromocyclododecane, were identified in these samples”. An earlier study by a research team lead by Dr. Janice A. Dye showed evidence linking thyroid disease in cats with exposure to PBDEs, which the researchers found to be elevated in blood samples of hyperthyroid cats. Their findings were based on analysis of blood samples from 23 pet cats, 11 of which had feline hyperthyroidism. PBDE levels in the hyperthyroid cats were three times as high as those in younger, non-hyperthyroid cats. Dogs and cats were contaminated with 48 of 70 industrial chemicals tested, including 43 chemicals at levels higher than those typically found in people, according to our study of plastics and food packaging chemicals, heavy metals, fire retardants, and stain-proofing chemicals in pooled samples of blood and urine from 20 dogs and 37 cats collected at a Virginia veterinary clinic. For dogs, blood and urine samples were contaminated with 35 chemicals altogether, including 11 carcinogens, 31 chemicals toxic to the reproductive system, and 24 neurotoxins. The carcinogens are of particular concern, since dogs have much higher rates of many kinds of cancer than do people, including 35 times more skin cancer, 4 times more breast tumors, 8 times more bone cancer, and twice the incidence of leukemia, according to the Texas A&M Veterinary Medical Center (2008). Between 20 and 25 percent of dogs die of cancer, making it the second leading cause of death in dogs (Purdue University Department of Veterinary Pathobiology 2000). Cat samples contained 46 chemicals altogether, including 9 carcinogens, 40 chemicals toxic to the reproductive system, 34 neurotoxins, and 15 chemicals toxic to the endocrine system. Endocrine (hormone) system toxins raise particular concerns for cats, since they include the thyroid toxins and fire retardants called PBDEs. Thyroid disease (hyperthyroidism) is a leading cause of illness in older cats (Gunn-Moore 2005). The growing use of PBDEs in consumer products over the past 30 years has paralleled the rising incidence of feline hyperthyroidism, and a preliminary study suggests that PBDEs are found at higher levels in cats stricken with this disease (Dye 2007). Studies also show a high correlation between eating canned food and developing hyperthyroidism later in life for cats (Edinboro 2004; Kass 1999, Martin 2000). In addition to PBDEs, hyperthyroidism in cats could be linked to the plastics chemical and potent endocrine disruptor BPA that is known to leach from the pop-top cat food can lining into food (Edinboro 2004; Kang 2002). High levels of flame retardant chemicals have been found in pregnant women, in breast milk and in children, and are implicated in the development of diabetes, obesity, and thyroid disease---common afflictions also of dogs and cats---and may adversely affect prenatal brain development in humans, and therefore of animals whose mothers are exposed to these same chemicals. One of the potent effects of PBDEs on the body is called endocrine disruption, an effect shared with other chemicals also contaminating food and home environments, notably pthalates and Bisphenyl A in plastics, food containers and food can linings; dioxins, PCBs, and organochloride pesticides that are common contaminants of various foods and drinking water. Some 86% of air fresheners, widely used in homes and offices, tested by the Natural Resources Defense Council contained phthalates. Recent tests of Chicago city tap water, for example, found perfluorooctane sulfonate, an ingredient in Scotchgard stain-fighting coatings, bisphenol A and tris (2-butoxyethyl) phosphate, a flame retardant chemical. Perchlorate, an ingredient in rocket fuel, fireworks, and explosives, can disrupt the thyroid gland’s production of hormones essential to prenatal and postnatal development and body metabolism, and is often present in municipal tap water. PFCs---perfluorinated compounds, like those manufactured for decades by the 3M Company, have been found to contaminate the food chain, fish in particular, as well as our home environments. They are widely-used water, grease and stain repellents found in carpets and on clothes, on fast-food wrappers, and on the inner lining of pet food bags. Teflon, Scotchgard, Stainmaster and Gore-Tex products contain PFCs. Some personal care products contain PFCs. They pollute water, are persistent in the environment, and remain in the human body for years. PFCs have been associated with cancer, reproductive problems, birth and developmental defects, and (recently) with immune system suppression. Dogs: High levels of plasticizers, grease-proof chemicals, and fire retardants. 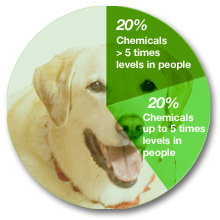 35 chemicals detected - 40% at higher levels in dogs than people. Cats: notably high levels of fire retardants, high levels of plasticizers, and grease-proofing chemicals. 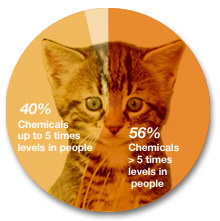 46 chemicals detected - 96% at higher levels in cats than people. Endocrine disruptors play a role in the development of diabetes Type 2 and thyroid disease (hypothyroidism and hyperthyroidism). In the past four years, diabetes rates among dogs in the U.S. increased roughly 33% among dogs and 16% among the nation's cat population, per a national analysis of pet health. This is associated with obesity, many pets being overweight according to a 2010 Banfield Pet Hospital report. The U.S. President’s Cancer Panel Annual Report for 2008-2009 will disturb many chemical manufacturers and other industry sectors with its bold assertion that since environmental toxins, especially chemicals, are the main cause of cancer, tighter regulations are long overdue. Home owners, parents and pet owners (since cancer is a major cause of death in cats and dogs) can take many steps, avoiding any questionable household cleaners and other products; drinking filtered/purified water; not using plastic food and beverage containers with harmful bisphenol A (BPA) and pthalates (also in many toys); washing conventionally grown produce to remove cancer-causing pesticides and chemical fertilizers if organically grown foods are not available; and minimizing “exposure to antibiotics, growth hormones and toxic runoff from livestock feed lots by eating free-range meat raised without these medications if available.” The report also advises “Avoiding or minimizing consumption of processed, charred, and well-done meats will reduce exposure to carcinogenic (compounds)”. For details go to www.environmentalhealthnews.org/ehs/news/presidents-cancer-panel. Regrettably this report failed to stress that the widespread use of lawn and garden pesticides and herbicides should be prohibited in every municipal community. Glyphosate-based herbicides, residues of which are in foods, have been shown to cause birth defects in laboratory animal tests, and many widely used agricultural pesticides are endocrine-disruptors causing infertility, abnormal genitalia and feminization, and could play a significant role in the genesis of various cancers. Lawn herbicides, which should be banned, are linked to lymphatic cancer in exposed dogs. These agrichemicals may also play a role in honey bee colony collapse, which is becoming a global epidemic and could mean ecological devastation and food shortages since one-third of our food crops need to be pollinated by insects. The problems caused by the above kinds of chemicals have helped create a multibillion dollar market for weight loss and control programs, liposuction and other surgeries, special diets for afflicted people, dogs and cats, as well as costly drugs that are not without their own harmful side effects. While a sickened populace may profit the health care industry, it is bankrupting state and federal health care services for the poor and uninsured, and families with escalating medical costs. Recognition of these hazardous chemicals in the food chain, drinking water and our home environments and the health problems that they can trigger calls for far more than simply changing what we eat and feed to our pets, and giving them and ourselves more exercise. State and federal government involvement, regardless of opposition from the chemical industry and related manufacturers of goods and foodstuffs, in addressing the long overdue environmental clean-up of the offending chemicals, needs to be sustained and intensified with better funding and expert staffing. Greater public awareness and appropriate action through informed consumer decision-making and home environment assessment and clean-up as needed are also part of the long-term solution to what is now a serious and costly public and companion animal health crisis. Filters: Conventional water treatment does not screen out many unregulated contaminants, but some household filters can help. Reverse osmosis won’t help get volatile organic compounds out of your water, according to the National Sanitation Foundation, but carbon filtration will. Water filtration products are certified by NSF International, a nonprofit group. Visit nsf.org. Food & Water Storage/Containers: Avoid all plastics, and with canned cat & dog foods, most 5.5oz cans are not lined with bisphenol A containing resins, while most larger sized cans still have this kind of lining. Dye JA, et al: Elevated PBDE levels in pet cats: sentinels for humans? Envir.Sci & Technol. 41:6350-6356, 2007 ( visit also www.epa.gov/oppt/pbde).